While this nifty device is fantastic for determining general and ambient activity levels of nuclear ionizing radiation (X, B, y), I have figured out a convenient way to calibrate this unit. It involves using a known source, and placing it such that the source is 3"/76mm measured from the central seam in the case at the bottom to the source. 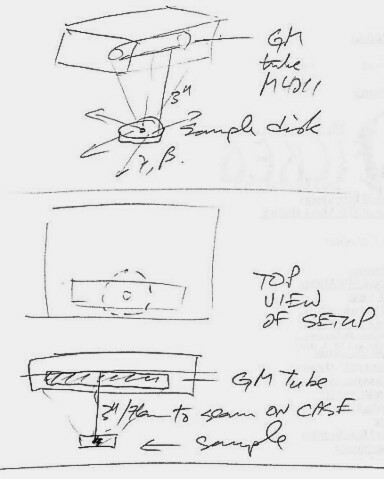 The unit is placed flat over the point source of known activity (like a Cs-137 disk for example), with the source also flat on a surface, centered with the base and the disk or source material sitting 1cm "above the base" (see attached diagram) and the counts measured over a 3-5 minute period. Run beforehand a background check with the unit in the same position for the source test. The CPM value for background on average will be subtracted from the measured CPM from the sample. A pseudo point source like this radiates in all directions, randomly. If our GM tube was a pancake type, we'd just set it over the source and have a 2:1 area ratio (the upper half of the source emanations are counted). The dimensions given provide the maximum cross sectional area that our cylindrical GM tube geometry can provide to "cut" an imaginary sphere of radiation form the source. If we wish to account for both efficiency and do semi-quantitative work with this unit, there's no other way with this tube. I have fervently worked out the math: this setup yields a 100:1 area ratio; that is, the CPMs over background from the source must be multiplied by 100 to get the "effective" CPMs that would have been read by a tube like this had it been able to encapsulate the total disk inside itself. Activities are measured in Bq or DPS (disintegrations/sec). 37000Bq = 1uCi, where a micro Curie is often the units used for source activity. You then take your adjusted CPMs (100*CPM - CPM background), and divide by 60 to get DPS/CPS. 1 CPS ~ 1Bq. So now your have determined the activity for the sample. If the sample is rated at 1uCi, for example, or 37000Bq, and you calculate your area-corrected measurement to be say 7000Bq, then then your detector efficiency with that source is 7000/37000 or 18.9% for the beta/gamma energies emanating from it. So, moving forward, you can then utilize this unit with a similar radionuclide sample of unknown activity by doing a similar measurement, but now use 528.5x the CPS over background to get the activity. (528.5 ~ (37/7 *100)) to account for the effiency of the detector and area ratio for the detector. Bear in mind that any calibrated disk samples (like 1uCi encapsulated Cs-137 disks) will also decay slightly over time, and the adjusted activity need be determined. Cs-137 has around a 30 year 1/2 life. A sample verified within a year will have around anywhere from 97-99% of its rated activity. This should be calculated to give the correct activity for the nuclide calibration source. Now for getting to the uSv/h, see next post. The more I learn, the more I realize I do not know! Okay... so we have an activity and a DPS and measured CPM above background for our calibrated source. How do we then get an effective dose rate? So, we take our CPMs minus background CPM, and then this is the value that should read 0.45uSv/h. We can then use this ratio for all three data points (until the updated GQ firmware may handle nonlinear values for now) and use this to have dose rate equivalent for the counts our unit measures. We thus have a calibrated, and dose rate adjusted unit to measure our sources.... neat hey? Thank you for your posting those useful information. Only drawing may need some better work. The above link is a great pdf file on dosimetry in general, and may be of some great use to the membership. A worthy look. use http instead of the h**p to go to page. FYI, slight error in the calibration info. at 7.9cm from source to middle of tube, the counts using Cs-137 @1uCi activity is 0.53uSv/h FYI. I found a more accurate updated value of the gamma decay constant which yields a slightly higher dose value. I have taken the liberty of ordering three (3) different gamma ray sources for calibrating my 320+ unit. They will arrive in several days, most likely mid-Sept. Using my procedure above, I will verify the dosage rate and efficiency of the unit over a wide range of gamma energies. This should give us all some good data on the relative efficiency and dosage factors for various gamma energies! Stay tuned. After doing some more detailed research, I found out that these cylindrical tubes, also known as "hot dog" G-M detectors, have a quirk: the inner 2/3 to 70% of the tube is by far the most sensitive and results in more than 90-95% of the sensitivity of the unit. Good to know! I recalculated the maximum area cut by a 4pi sphere (surface emanating from the Omnidirectional source, and got a new value of 1.25" (30mm) from the source to the TOP side of the unit. This results in NOW a 20:1 area ratio - and because we're closer to the source by almost 3x, the counting errors over background should be much easier to handle. I also found out that for general dosimetry, Cs-137 is the general standard since its 661keV photon is right close to unity response in a compensated tube like the M4011 in these units. That does not mean that I won't check the high and low gamma points with my soon-to-arrive radio sources, but now I can evaluate a more representative value for the CPM/uSv/h response of THIS tube. I see nowhere published on this tube, and how do manufacturers actually get a gamma sensitivity of a tube anyway? Unless they match the source geometry to the tube, what do those numbers mean? 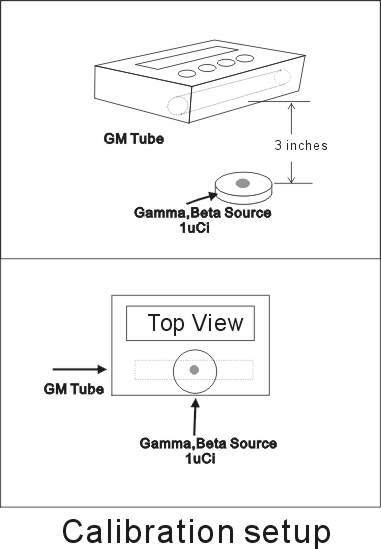 So, the layout is the same as in the crappy drawing except the middle seam of the GMC unit is 1" from the top surface of the source, or the top of both the unit and source are 31mm apart. D = (6020-20)/3 = 2000 CPS effective. So in this case, a general sample with unknown activity could thus be estimated by taking (37/2)*(20/60)*CPMs (minus BG) and multiplying this all out to get the approx. Bq activity of the sample (setup in same configuration). This is VERY close to 6*CPMs in this example. ooops can't edit my entry, so there you go! I redraw the setup picture based on Alchemy2 s drawing. This one should be easier to understand. The height is actually 68mm to the center of the tube, so approx. 75mm (3") to the seam - close enough. 100:1 AREA ratio is used when considering this setup. So, take activity of source/100 for effective source flux through the tube when getting efficiency. An alternate setup, height-wise, as mentioned before, considers the most active region of the tube, the inner 67-71%. In that case, height is about 29mm to seam (~1"to the base of the unit) above the source disk. Use a 20:1 area ratio for this one. Once my sources arrive, I'll be able to do some good determination on 2x 320 plus units, and I'll do these before modifying unit#2 with the pancake SBT-11A tube. I'll take care not to get beta initially in the mix, using shielding, so one can see the gamma dose #s compared ot what we're using. Should be very informative! ~3" to the top of the unit when laid flat. You want ~68-69mm to the tube top approx., or ~63mm (2.5") to the center of the tube axis. Just to clarify, one would assume that a ~1:8 area difference would ensue between the two configurations, one being ~64mm the other being ~25mm to the tube axis. However, in the first case, one envisions a sphere with surface cutting totally just inside the entire tube's active glass part. With the closer configuration including primarily the most active ~70% region, this is not so: The tube is cut by a sphere of radius ~29mm and the surface of the sphere intersects the tube's inner volume, appearing like a "figure eight", or lemniscate, comprised of two nearly elliptical surfaces end to end, and reach zero size where the sphere JUST touches the center top of the tube. This is determined to be very close to 20:1 ratio in surface area (within 0.5%) according to the math. One cannot take a simple cross sectional area calculation until the tube is significantly further out from the source, say nearly 0.6-0.8m or further. Just letting you folks know. Used 0.25uCi Cs-137, 1.0uCi Co-60, and 1.0uCi Ba-133 source disks, all made within the last 3 weeks. See below for the test setup. Disk top surfaces were placed at 29mm from tube center axis, Background was the nominal 20 +/- 3 CPM. Cs-137 yielded 90 CPM average, Co-60 was at 1310 CPM, and Ba-133 was at 560 CPM. Using 2pi geometry since this is all the detector could see, we have a 10:1 area ratio in that case, when figuring the total activity vs the CPS counts from the raw CPM data. 3.17 CPS (total Ba133) gave 0.52% eff. 21.83 CPS (Co60) gave 1.2% eff. Using the CPM data, the dosage numbers came out to be: Cs-137 (92), Ba-133 (159), Co-60 (88). However, If I do not know or have a general mixed source then what?! Well, there's a relation for Co-60: CPM/8.77 = CPM/uSv/h; using this, I get 1310/8.77 = 149.37. close to the 151.5 reported for this tube type. Since NORM is likely to be present in an environment the most, I plan to use 159, I'll use the appropriate factor to figure the corrected dosage value as needed. I'll use 155 CPM = 1.00uSv/h, 1590 CPM = 10.00 uSv/h, and 15900 CPM = 100.00 uSv/h to cover all the major dose ranges without an over range condition showing up. NORM typically has the bulk of its peaks in the gamma spectrum due to Pb214, Bi214 Pb210 daughters. Ba133's main peaks at ~330keV seem to be best for covering the energies present in NORM. I plan to do some more analysis and measurements shortly, and double check the dose numbers too. Used 76mm for distance to tube #2 (SBT-11A), 84mm to the tube #1 (M4011 main axis) and used a 1mm steel beta shield for ALL measurements. Unit #1, stock M4011 tube, BG = 20 CPM, same conditions, d=84mm (76mm to case), 1mm beta shield (*dose values red. by 1.221x due to extra distance in test). One could argue that the Cs-137 may still have either a bit of beta leakage, or most likely, since this source is only 0.25uCi compared with the 1.0 uCi sources for Co/Ba, the error is higher, because the counts are closer to the BG values (BG has greater impact on readings). Given this fact, and the range of energies covered by Co-60 (>1 MeV) and Ba-133 (~0.35 MeV), I opted to use the average of their ratios for the settings: Unit #2 is then 240.5, and Unit #1 is 150.5. 241 and 151 are close enough! If we assume that the 1.176 MeV beta ray from Cs-137 passes the shielding, then I have only 85% of the counts accountable as true gamma rays for Cs-137 counts. If I look at the first test, at 43, then only 0.85*43 or 36.6 CPM are from gamma. Thus I then get 258.6 CPM/uSv/h in the adjusted case, which is more in line with the numbers seen for the other two isotopes. (assuming the SBT is a compensated tube. Doing the same with the other tube, yields 162 CPM/uSv/h, much closer to the other two as well.